Just four months ago, the students and parents at Valley Fellowship Christian Academy were standing on a hard, cement floor, packing meals for students in Haiti. It was a win-win kind of activity. They were packing meals for impoverished families in Haiti and raising money for a new gym floor at the same time. Still, even with the $30,000 earmarked for the gym floor from the meal-packing fundraiser, they were a long way from their goal. The new gym — not to mention the whole new facility — was a huge undertaking for the small school, but they believed God would provide. And He did, in the form of a humble, hardworking pastor from outside Atlanta. In August, Pastor Roe Nall, Jr. stopped by the school with a check in hand for the remaining balance — $60,200 — needed to complete the gym floor, said Patti Simon, head of Valley Fellowship Christian Academy. Pastor Nall has a grandson at Valley Fellowship’s elementary school, and he has fallen in love with the school and its mission over the years. Not only was the donation a way to give back to the school, it was a way for the pastor to honor his late wife, someone he describes as a humble worker who had a passion for working with children and teens. She is the Founder of Teen Reach, Inc. The Mayfred JoLinda Hughes Nall Gymnasium is set to be completed and dedicated in the next few months and will continue to help Valley Fellowship Christian Academy in their mission to raise Godly leaders — no doubt, Mrs. Nall would approve. Pastor Roe Nall, Jr. currently serves as Chairman of the Board and Chief Executive Officer of a wonderful and humble ministry. It’s one of those math problems that won’t make sense unless you factor God into the equation. 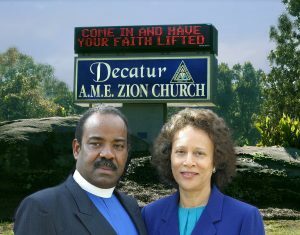 Reaching and Meeting Needs (RMN) Worldwide Ministry, Inc., a ministry co-founded by Pastor Nall and his late wife Mayfred, is situated in Lithonia, Georgia, one of the bedroom communities on the southeastern edge of Atlanta. Pastor Nall has been in ministry for more than 45 years, serving congregations in Alabama, Ohio and Georgia. During his tenure, he has successfully spearheaded outreach ministries to the incarcerated, nursing homes, the elderly, homeless shelters, as well as programs to help families become debt free. Although Pastor and Mrs. Nall worked very closely together, Mrs. Nall had her own very special ministry reaching out to the community. She listened and observed for needs and quietly met them. Long before God inspired the founding of Reaching and Meeting Needs Worldwide Ministry, Inc., Mayfred sought out the homeless, hungry and naked and quietly reached to meet their needs from private resources. In her own quite ways she taught the importance of loving God and loving each other. Pastor Roe and Mrs. Mayfred Nall both hail from Fayette, Alabama and still have strong ties to the area. They were reared by parents whose only source of income was from domestic work. Neither mother ever made over $18.75 a week from domestic work. This husband and wife team readily recognized and acknowledged that they could not have reached their successful milestones in life except by the Grace of God; through the prayers of their mothers; their individual and collective prayers; and the loving and kind support that God provided for them through others. Their grandson, someone Patti describes as a strong student, is already developing strong leadership skills in school. Pastor Nall told Patti he was astounded at the academic growth in his grandson, and he appreciated that the lessons they were teaching him at home about God, life and faith were being reinforced at school. Physical education is just one part of Valley Fellowship Christian Academy’s three-pronged approach to education — a part based off of scripture verses found in Luke 2:40-52, which describe Jesus’ growth mentally, physically and spiritually. That’s why the gym floor was so needed. For more than 30 years, Valley Fellowship has been renting out other facilities for their practices and sporting events, but soon they will be able to host home games. “We want our children to develop healthy, physical bodies, so we emphasize PE. We emphasize sports,” Patti said. The $90,000 price tag for new gym floors may seem high, but there’s a good reason. Gym floors, unlike hardwood floors found in our homes, are specially curated with anti-mold technology and have a foam pad underneath the wood to absorb some of the shock jumping might place on the students’ growing joints. “We could have put plastic down, we could have put vinyl down and just gone ahead and played, but … it wouldn’t have been good on their joints. And long term, it wouldn’t have held up for more than 10 years or so,” Patti said. The new school and new gym will provide countless activities and outlets for students to grow up healthy, and the new gym floor wouldn’t have been possible without Pastor Nall’s dedication to help children. As soon as the floors are completed, Valley Fellowship Christian Academy is planning a ribbon-cutting dedication ceremony to show their appreciation to Pastor Nall. For now, they can just rest in knowing that it all came full circle — from standing on the old gym’s cement floors, packing meals to bless those in Haiti, to being on the receiving end of a blessing.